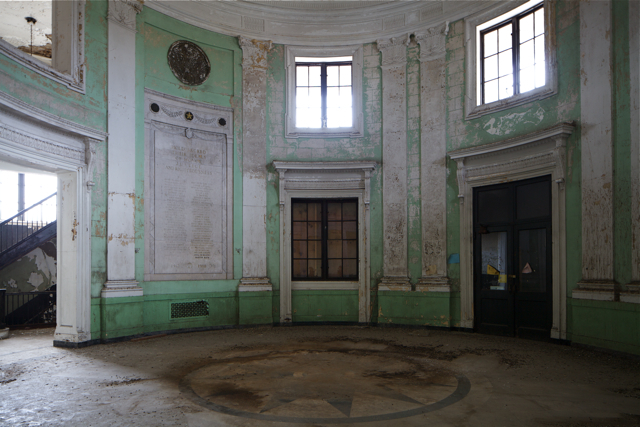 Germantown Town Hall stands vacant, an unsurprising outcome for a building that was constructed more for political than practical reasons, not once, but twice. The first Town Hall, popularly called Old Town Hall, was designed by architect Napoleon LeBrun, and built on the site in 1854. Germantown was one of many independent municipalities that spent as much as possible prior to being consolidated with Philadelphia in 1854, knowing that the city would assume all existing debts. Paradoxically, both iterations of the Town Hall were a way for Germantown to symbolically assert its independence from Philadelphia. 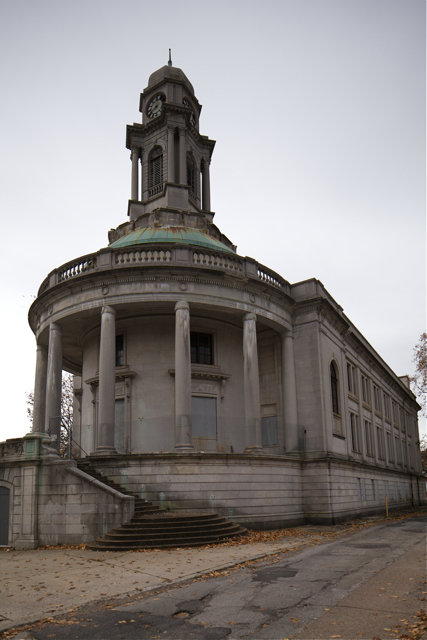 The city was now saddled with a building it would struggle to find a use for. 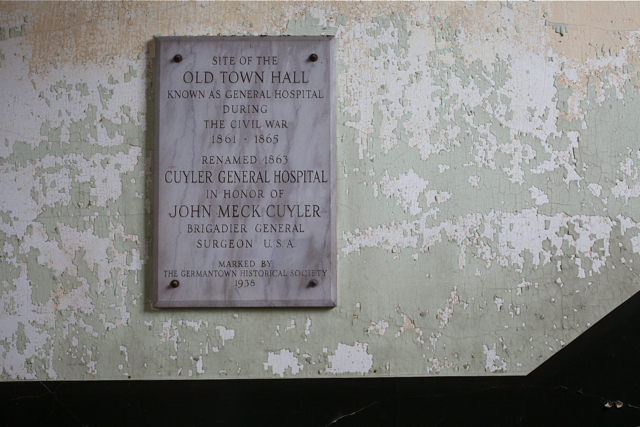 Over the years it housed a police station, hosted traveling shows and political meetings, and served as a hospital during the Civil War. 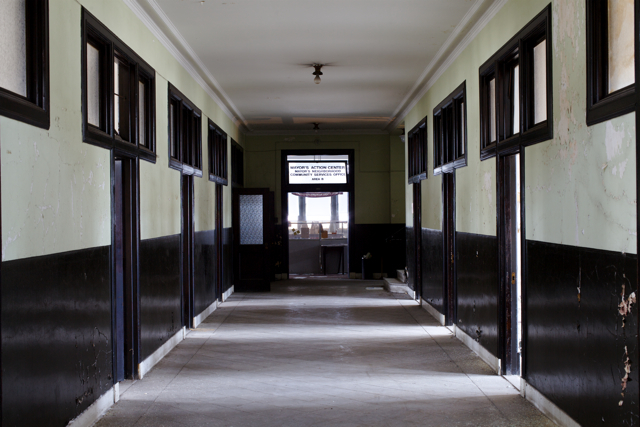 In 1920, the building was declared structurally unsound and demolished. A new Town Hall was promptly built on the site thanks to Mayor J. Hampton Moore’s campaign promise to house all municipal functions in city-owned buildings. Architect John Penn Brock Sinkler modeled the Beaux Arts/Classical Revival building on William Strickland’s Merchant’s Exchange building on 3rd and Dock Street in Old City. The clock tower and rotunda facing Germantown Avenue solved several design problems at once. 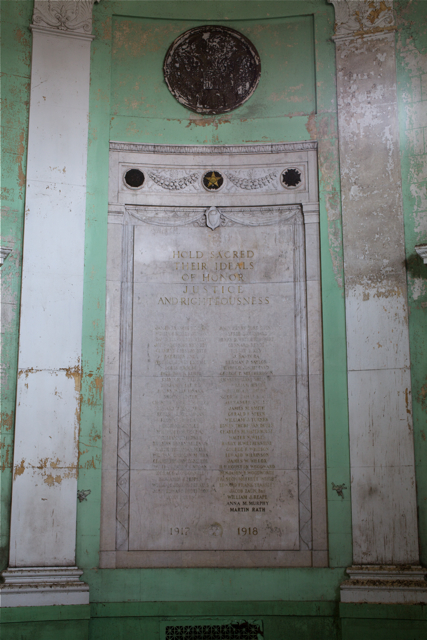 It was well suited to the awkward, triangular lot, with a place for the bell and clock from the old Town Hall building, and a stately space for two memorial tablets memorializing the 123 sons of Germantown who died in WWI. 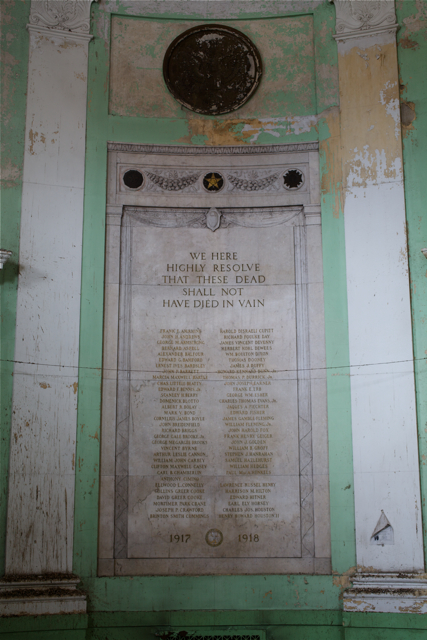 The building was dedicated on Armistice Day, 1925. 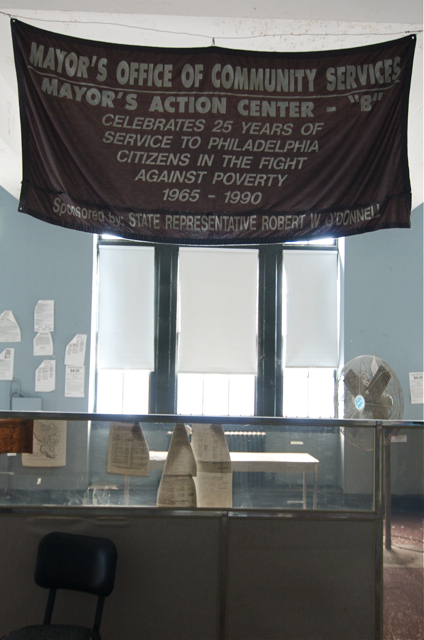 Initially, the Highway, Survey, Tax and Magistrates offices were located in Germantown Town Hall, in keeping with Mayor Moore’s campaign promise, but the City later centralized these functions, and by the 1980s, only a few city offices occupied the space. 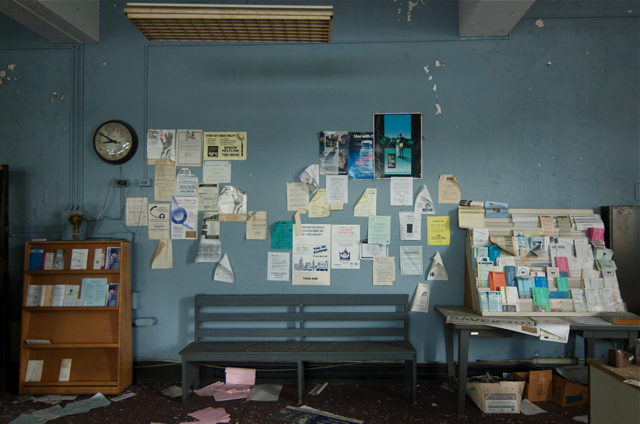 The Town Hall has been vacant since 1998 when a City Community Services office closed. It is owned by the Philadelphia Industrial Development Corporation (PIDC), and is currently for sale for $400,000. The building has deteriorated significantly, and conversion to office space has been estimated at $10-$15 million. City of Philadelphia, Philadelphia Industrial Development Corporation (PIDC), Historic Germantown, East and West Mt. Airy Neighbors Association, Mt. Airy Business Association, Preservation Alliance for Greater Philadelphia, Germantown Community Development Corporation. 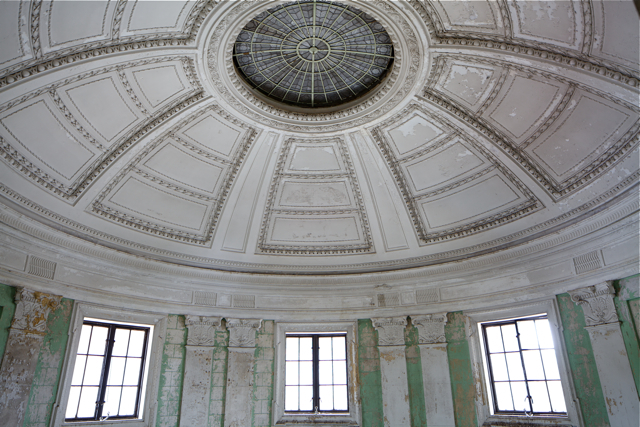 Germantown Town Hall is in good overall condition structurally and has a large number of potentially useable spaces, including multiple large administration rooms and a dramatic three-story rotunda. All of the spaces as well as matters of public access and circulation however, will be subject to risk assessment and approval by the City of Philadelphia, as the building contains potential hazmats in the form of biohazards (from animals, insects, and mold), as well as materials such as lead paint and asbestos. In general, the building is appropriate for visual and performance installations of all kinds and sizes. 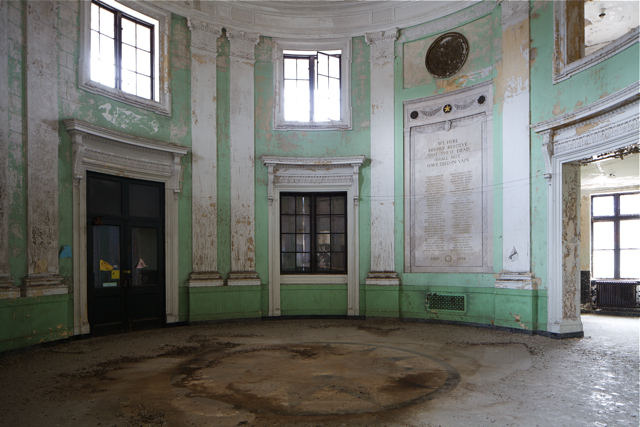 Remaining in the building, along with furnishings, papers, and administrative bric-a-brac from 1990s, are some notable features, including World War I memorials in the rotunda and an historic bell in the clock tower. There is a large parking lot adjacent to the building, which could be secured for staging purposes or other outdoor uses. Given the potential hazmats in the building, audience circulation will likely need to be limited, so works that occupy most of the building or require a lot of movement of the public around the building, in particular from floor to floor, will be less feasible. Electrical service is limited but can be supplemented by generators, and there is no running water on site. 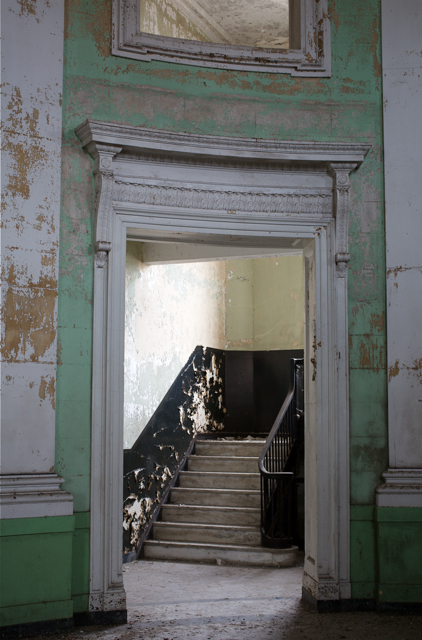 Hidden City will seek a Temporary Certificate of Occupancy (TCO) from the City of Philadelphia’s Department of Licenses & Inspection, should this site be included in the festival.